The data presented below has made the rounds quite a bit in Zed Threads and the like. Most folks generally agree with the overall general improvements made after WWII by successors to the UHF connectors like N, BNC, etc. Some have argued the selection of UHF connector components for this test are arbitrary, without a quality pedigree and, hence, put into question the measurements below. It’s true I simply picked from the drawers every conceivable type of UHF adapter, barrel, etc. for the tests so I agree it is simply what I had to test. The trends shown below while statistically sound should add and include whatever constitutes a “quality” UHF connector in the 21st century. What that actually means for a connector standard no longer maintained by any standards authority is anyone’s guess. I am quite curious though. Therefore, if you have a make and model of UHF connector you feel is Top Gun and worthy of adding to the test results below, please forward me information I may use to purchase some examples. With your help I will be glad to test and add these Top Shelf UHF connectors to the results. Just understand I do need your help with suggestions. Please send info to kx4o@hamradio.me. Thanks. Now… back to the original post. In our final installment of tests to compare the ‘UHF’ connector with more recent offerings I present the graphs below to answer the question… Is the UHF connector inferior to later connector designs? I presented these results to members of my local ARA and opened some eyes. One thing learned during the extensive discussions at this presentation was how materials for the PL259, SO239 and related connectors have changed over the years. The best point heard at the meeting was the sampling of ‘UHF’ connectors for these tests were arguably too small to statistically prove any point. I agree and a plan for future tests with many samples of each connector type is in the works. For now, however, you are free to make your own conclusions with the data as presented in this post. 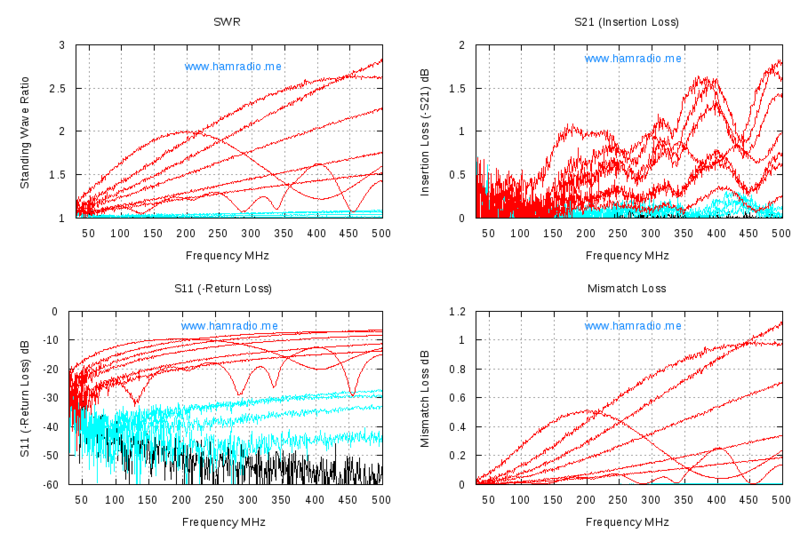 Five different graphs are used below: Return Loss, Mismatch Loss, SWR, Insertion Loss and Intrinsic (Heat) Loss. Return Loss (aka -S11), SWR and Mismatch Loss are related to each other and can be calculated from each other with formulas. Note – I assume ideal circumstances in the calculation of Mismatch loss since this loss can differ in some real world conditions . 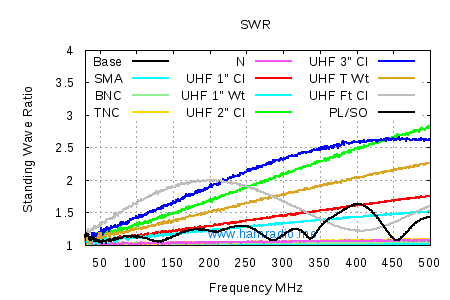 In this test, SWR and Return Loss are directly measured with a calibrated VNA. Mismatch Loss is calculated from Return Loss. 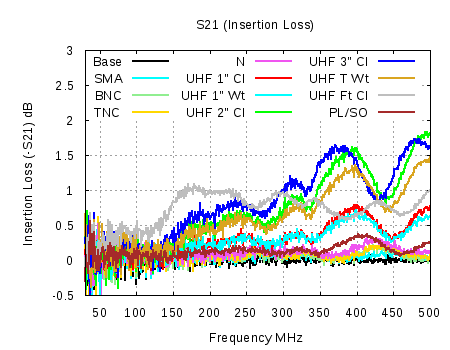 Insertion Loss is simply the S21 measurements from the VNA and indicates how much energy did not make it through the connector(s) under test. Intrinsic Loss is the final graph and is calculated as the difference between energy bounced back from the test item (Mismatch Loss) and that which does not make it through (Insertion Loss). This difference is missing energy and is energy likely turned into heat via dielectric material losses. UHF vs. N, SMA, etc. The stunning result is all the UHF connectors in the test have worse performance than all the other connectors. One immediate conclusion concerning ‘UHF’ connectors is they will function at these higher frequencies, but one must decide if using the PL259 or SO239 is worth it in an age where its deficiencies have been made moot by ALL connector designs since WWII. Now let’s get into the colorful graphs which are the same data as above, but with each line identified to the device under test. The following table shows the ties the abbreviation in the graphs to the item under test. Baseline: Direct connection of test cables using superb SMAs. SMA: Same as baseline plus two more SMA barrels. BNC: Two SMA to BNC Converters plus one BNC Barrel in between. TNC: Two SMA to TNC Converters plus one TNC Barrel in between. N: Two SMA to N Converters plus one N Barrel in between. UHF 1″ Cl: This is a 1″ Amphenol Model PL-258 Barrel with clear dieletric. UHF 1″ Wt: El cheapo 1″ SO-239 Barrel with White dielectric. UHF 2″ Cl: A 2″ SO-239 Barrel with Clear dielectric. UHF 3″ Cl: The combination of the Amphenol 1″ and the 2″ using a Male-Male joiner. It is really about 3.5″ long. UHF T Wt: A UHF T adapter with two SO-239 and one PL259 and White dieletric. The PL259 port was left open. UHF Ft Cl: A 12.5″ long SO-239 Barrel. This is the thing used to stick through walls. PL/SO: One SMA to N, then N to SO-239 Converter directly mated to one PL259 to TNC converter then TNC is adapted to SMA. This is the only non-barrel UHF configuration and presents the smallest and shortest impedance bump to the RF signal of all the UHF connections under test. Note: Click any graph below to reveal more detail out to the absurd test frequency of 1 GHz. No one would ever use a UHF connector at this high a frequency, I hope, but the resulting patterns are interesting nonetheless. …we see the various UHF barrel lengths have different effects. The PL/SO line is simply one PL259 mated with one SO239 with as little other interaction as possible. Indeed the PL/SO performs the best of the UHF bunch. Being a ratio of incident energy vs. reflected energy, larger Return Loss values indicate better performance. It’s a bit like the “Yes, we have no potatoes” statement. Yes, we have lots of power not returning to the source. The straight S11 measurement makes more sense. “The power reflected back is 10dB down from the power applied” means 1/10th power is reflected back to the source. A Return Loss (or S11) of 0 dB is awful as this means ALL the power is being reflected back (aka as an open or short at the end of the transmission line). This relationship doesn’t always hold true in non-ideal circumstances as discussed in VK1OD’s page about Mismatch Loss . He reminds us in some cases the mismatch loss can be higher or lower than the general formula suggests. Accepting the ideal situation, we now have something we can relate to. A mismatch loss of 1 db means that, because of the energy reflected back to the source, 1 dB of energy will never make it to your load… if the source absorbs all the reflected energy. The one case where this is true is when the transmitter has an isolator in line. It is possible, maybe even likely, the source will re-reflect the energy back to the load (similar to what happens when you use a transmatch). The tuned ladder line feeder dipole is another example where reflected energy is reflected back towards the antenna. Look at the blue line for the 3″ SO-239 barrel. It measures a max of 1 dB loss due to the impedance bump. 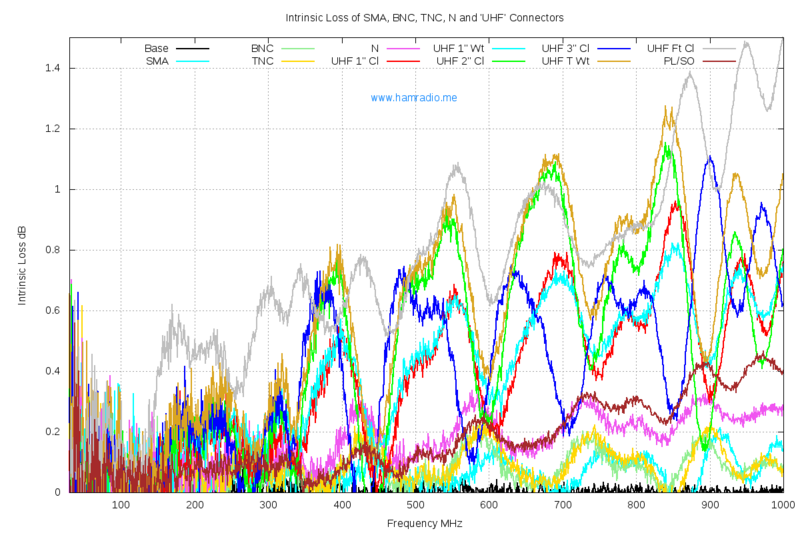 It should be interesting to the reader the N, SMA, TNC and BNC connectors are on this graph, but in the thin pastel smear on the 0 dB line. This graph looks a lot like Mismatch Loss doesn’t it. Note the blue line again. What is 1 dB loss due to impedance issues shows as more than 2.5 SWR. In the above graphs did you notice the gray line response of the 1 foot long SO239 “barrel?” Just like a broken “analog” clock is correct twice a day, so it is with transmission lines of differing impedance when they are 1/2 or multiple 1/2 wavelengths long. With the first low point frequency of the foot long barrel and its length you can compute the velocity factor if you like (reader exercise). The same holds true for the shorter UHF barrels, but you will need to click the 1 GHz plots to see this better. 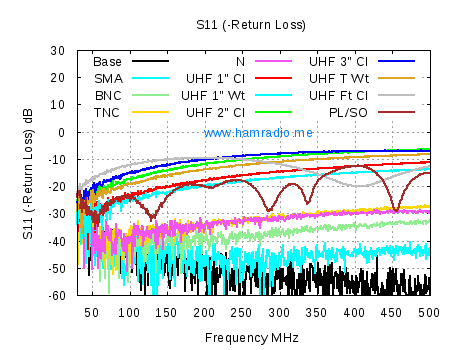 The 3″ barrel (blue plot) 1/2 wavelength point is evident in the 1 GHz plots. At long last its time to show the energy that actually did not make it through the connectors in the S21 test. The above graph shows us the real cost of using UHF connectors. Being a measure of total losses, it is the combination of Mismatch losses plus any heating losses in the dielectric materials. You finally can see some imperfections in the N, SMA, TNC and BNC connectors. However, they all handily beat every UHF component. So how do we measure actual heating loss of an RF system? Several folks in the Amateur Radio world have devised clever laboratory assemblies to directly measure this heat. The UHF connectors have a bit more “heat” loss than the other modern connectors, but, let’s be honest, the UHF connectors are on par with the modern connectors. What are we to make of all this? Well, even with this arguably small sample size a trend emerges suggesting UHF connectors have inherent design issues that were nicely solved by later connector designs. Indeed, these later designs were likely developed to directly solve the issues in UHF connectors. Many suggest the UHF connector is usable at VHF and UHF frequencies. Indeed it will function, but with some cost. It is likely completely unfair to suggest the UHF connector was designed to work above 30 MHz. It served a purpose before WWII and will still work quite well, electrically, at 30 MHz or below. 50 MHz is not too much of a stretch either. Amphenol maintains the UHF connector, with good quality materials, will do quite well up to 300 MHz. Note one of the two 1 inch UHF barrels with the Clear (Cl) dielectric is an Amphenol product – Model number PL-258. Judge for yourself. This Amphenol reference doesn’t seem to understand UHF once meant 30 MHz. There are many more reasons to stick with Amphenol connectors and avoid the $2 products, but likely not this one. Some claim since mobile dual-band radios use the SO-239 connector, it is designed to work well at UHF – specifically the 70cm band. Indeed, my Kenwood TM-D710 has the SO-239 connector. However, did you know the European version of the D710 uses the N connector for both 2m/70cm antenna jack? Sigh. I have a permanent PL259 to TNC adapter on my D710. Another good example radio is the Icom 910H which uses an N connector for the 70cm antenna jack. It seems when performance counts, the ‘UHF Connector’ is not used for the modern definition of UHF. It would seem American hams have a love affair for the UHF connector and are, unfairly, giving it properties it may never have had. A mind-blower for sure. However, to be fair, the UHF connector has, in the past, been seen to work reasonably well up to 500 MHz as shown by A. B. Crites in his extensive analysis and tests of various dielectric materials in the UHF configuration. Are the UHF connectors in my sample pool of the same quality as used by Crites? I don’t know, but I suspect not. A better funded test with larger sample sets of various currently available offerings is in order. Contrary to what many believe, it is not true that when a transmitter delivers power into a line with reflections, a returning reflected wave sees an internal generator resistance as a dissipative load. Nor is the reflected wave converted to heat and lost, while at the same time damaging the final amplifier (sic). In other words, Mismatch Loss may not be a big deal in typical stations. Is the UHF connector design electrically inferior to the newer N, SMA, BNC and TNC designs? Of course it is as the above easily reproducible tests reveal. 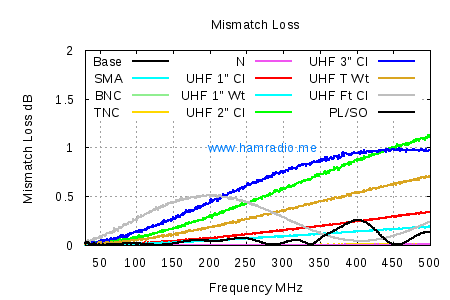 Most of the issue, however, is Mismatch Loss which may not be a pressing issue in everyday radio systems. Notably, the Intrinsic “Heat” Loss is quite small. The UHF Connector is barely noticeable at 50 MHz and practically invisible below 30 MHz. No electromagnetic worries for these bands. The “UHF” connector is less suitable above 144 MHz. The question is not if the UHF Connector has more loss than modern connectors, but if this loss matters in your system. By all means use the PL259 and SO239 connectors, but understand and accept the limitations as measured and shown above. Personally, I use N, BNC and TNC for anything above 30 MHz plus N and BNC for HF where practical. Unfortunately, it is a bit difficult to distinguish between some of the colors on your graphs. quickly compares and clearly shows how all the modern connectors easily performed much better than the UHF variants. Folks can draw their own conclusions from the data. Thank you. Yes, I clicked on the graphs to make them bigger. I also color calibrated my monitor and printer. Still difficult to 100% distinguish which plot is which. Here is the raw data for those who desire to graph for themselves. It includes a mini-UHF and, for fun, a banana jack as well as the more typical connectors. I know that they're not very popular for amateur use, but I'm curious about how the mini-UHF connectors would rank since they are similar in size to the TNC connector. I did test a few mini-UHF connectors. Electrically they seem good, but mechanically they raised my BP. When I got them to connect well, they did perform better than the best 'UHF' connector and almost, but not quite, as well as N, BNC, TNC and SMA. The real problem I had with the mini-UHF is getting them to maintain a solid connection during testing. They were very sensitive to movement on the test bench. No other connector, including the several UHF types, gave me this much grief. It didn't take long for them to exceed my patience as my desire to finish testing exceeded my desire to include them. The mini-UHF relies on the shell for shield contact, just like the UHF; I think that was the cause of the problem. We see them often on the Motorola radios at work. I'm not convinced their design ever solved a problem not already solved by BNC, TNC and others. 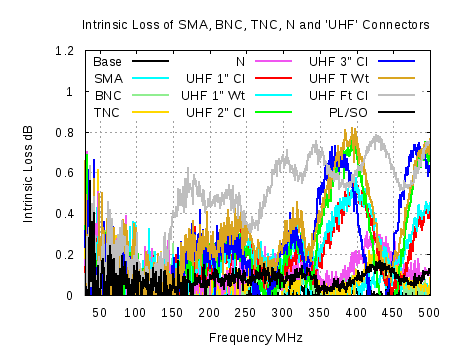 It includes one plot for the mini-UHF. Bless you, John, for posting the full S21 and SWR numbers. Another "thank you" for the effort. Good stuff. Thanks for the tests and write-up. When looking at various manufacturers specifications, they didn't claim that their UHF connectors were 50 ohms. This is of concern to me and may explain some of the test results, regardless of manufacturer or materials. In many cases, they were stated as "unknown". I am not entirely sure why, though it is perhaps by design. 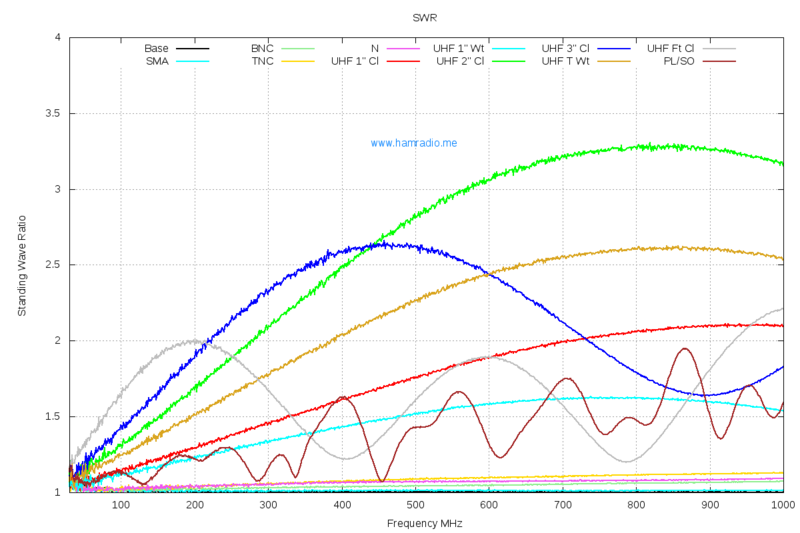 The SMA, N and BNC specifications I have seen have all stated a design of 50 ohms. I do wish the US versions of radios came with the N connectors found on much of my measurement equipment meant for use above HF and sometimes I dream about opening the unit and installing a panel-mount N connector. Your observation the UHF connector folks don't claim a 50 ohm surge impedance is spot on. However, the often implied useability at VHF and UHF frequencies suggests it has to function in 50 ohm systems. So they won't claim 50 ohms, but do say it works well in 50 ohm VHF/UHF systems – conflicting requirements at a minimum. 2 comments on your observations: 1) The fact that test equipment comes with Type-N (and now, SMA) is indicative of what are the best options are available. 2)In nearly all cases, replacing SO-239's with Type-N's is straightforward, as the footprints of the connectors are identical. The only concern would equipment that is still under warranty. On my new equipment, I waited 60 days before replacing the factory connectors to allow for the initial break-in. Infant mortality normally occurs within that period. If it concerns you, wait for the warranty to expire before replacing the factory connectors. I replaced all of my SO-239's with Type-N females, except for my two mobiles; those I replaced with SMA's to mate with my existing Larsen NMO/LMR-200/SMA mounts. I think you should replace your SO-239's with Type-N (or SMA for low power and mobile use), except where you have warranty considerations. I was wondering up to what extend such losses are also evident on UHF connectors attached at the end of cables (RG58, RG213, etc). 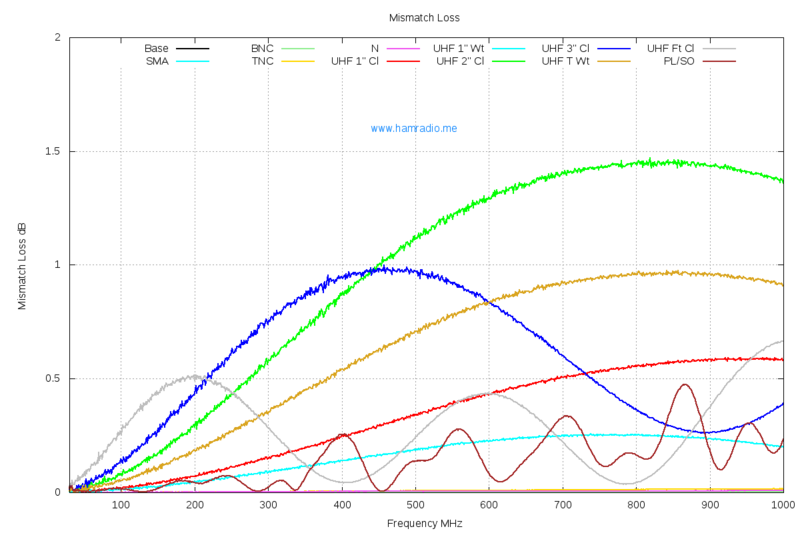 I measured a 50m long Hyperflex-10 with my MiniVNA Tiny and, especially on the UHF band, the losses were about 1.5dB worse than the specifications (~5.5dB instead of ~4.2) which is a significant deviation. I suspected the UHF connectors at each end of the line, although these are of high quality (waterproof with bulk body). But, in any case, it seems that the 'UHF' series connectors and adapters is a hopeless choice for anything above 50MHz,no matter what, although they're popular for interconnections around the ham shack. "UHF" connectors aren't described as having a 50 ohm impedance because they simply don't. If you look at a transmission line, the characteristic impedance is a function of the ratio of diameters of the inner and outer conductors. This ratio is not preserved by the dimensions of a "UHF" connector. The change in impedance, especially when splicing together segments of cable, creates wave reflections. The results of these tests would look entirely different (worse, that is) if 10m cables were used between the test equipment and the connectors. Also, with a 5m open stub hanging off of the open arm of the T-connector, you'll see periodic transmission zeros throughout the VHF band (try it!). The key idea here is not that UHF connectors are lossy at high frequencies but that they create reflections, which appear as loss when the cables are short, and resonances when the cables are long. "Short" and "long", that is, with respect to the wavelength of the signals in use. Verily the culprit is mismatch loss. Unless I'm missing something, the insertion loss (which as I understand it is the ratio between power measured at the output to power given at the input) for most of the UHF connectors you tested was below 0.5dB. In fact, you had to use a barrel connector to get above that figure, which I was already assuming I should avoid at all costs. Why is 0.5dB (actually closer to 0.25dB but I can't be sure) something worth being concerned with? I will of course grant that sattelite, EME, and other specialty uses of the band require every last milliwatt you can muster, and 0.5dB might be the difference between making that contact or not. Are we simply talking about getting that last 1% of performance, or am I missing something more fundamental? Most times the loss is not a problem so, yes, we are talking about the last small amounts of performance – most likely. 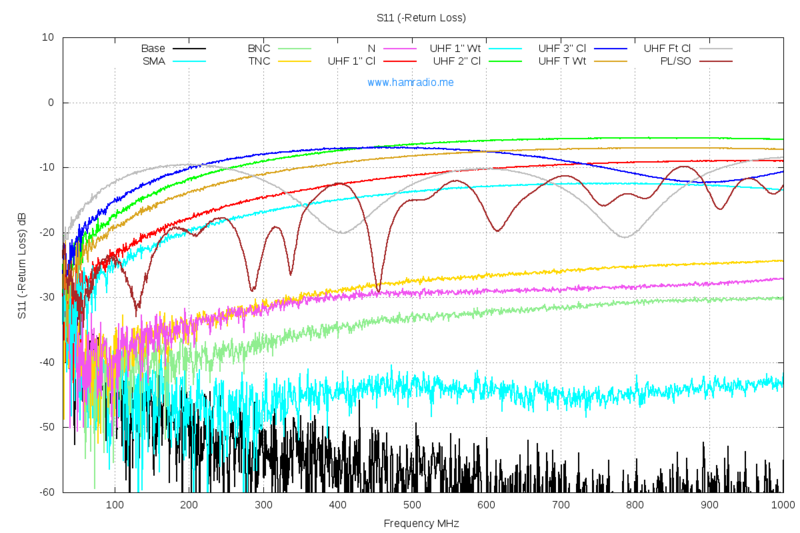 The point of the tests is to combat the myth promulgated by PL259 fanboys the UHF connector was ever designed for frequencies above 30 or so MHz. That people use them for VHF and sometimes UHF is just fine and dandy so long as expectations are managed appropriately. Sometimes losses add up to a problem, sometimes they don't. Viva la choice thanks to post WWII connectors with currently active design specifications and demonstrably superior characteristics. Thanks for clearing that up. I use them out of convenience, knowing they aren't the ideal solution, just wanted to be sure I understood properly what I was doing. Great post btw, your blog is filled with excellent work! I had no idea there was a war going on. I would like to see a test using RCA connectors. Why they ever used RCA connectors with RF equipment is beyond me. So how do we get the transceiver, amplifier and cable manufacturers to use frequency appropriate connectors on their products? We can start by asking Kenwood since they market the spiffy TM-D710 in both an american and european version. The EU model has an N connector whereas the american version has an SO-239. Why can't the american version have the N? Having two models differing so certainly costs more money than one assembly line hence you can bet the answer has plenty to do with marketing expectations of the target markets. We have to start asking for the N connector on any radio 220 MHz or above… and maybe 2m+ as well. Given the nature of UHF connector adherents found on The Zed and elsewhere, I have little hope. UHF connectors have in fact been used by RF engineers at Motorola, GE, etc with great specs to 500 mhz. 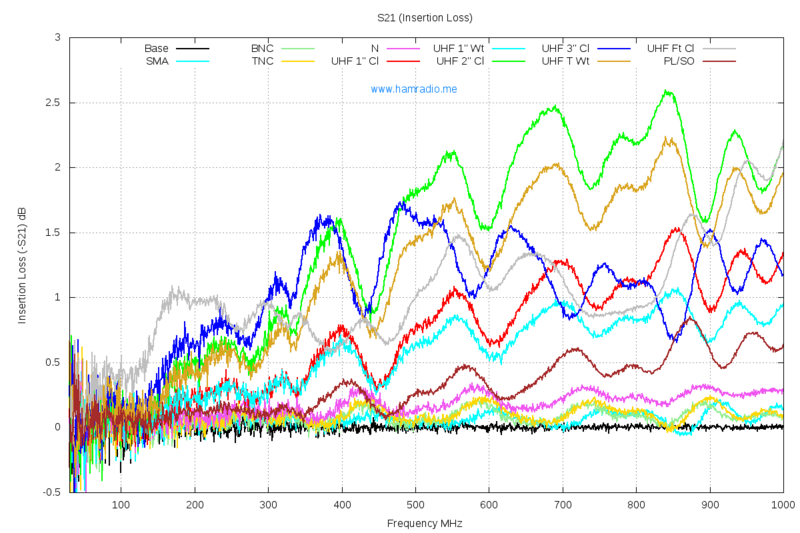 Uhf duplexers using 8 uhf connectors per side had less than 1.5 db loss at 500mhz measured with a $16,000 dollar service monitor. Diamond antennas entire antenna line uses PL 259 connections on their uhf antennas. Diamond also sells UHF connector lightning protectors rated dc-2.5ghz. Polyphaser also makes uhf connector protectors rated to 700mhz and less than a tenth of a db loss. I.C.E. uhf protectors are rated to 500mhz and a tenth of a db loss. So they all must be lying???? milliHertz? Seriously? I'm sorry… who's uneducated here? The measurements shown were made with a $45,000 R&S VNA. The losses measured are as real as the day is long. Diamond Antenna notably uses an air dielectric in their 'UHF' connector. Perhaps this is for cost or an actual attempt at modifying the characteristics. Either way it points to a lack of conformity to the long extinct 'UHF' connector specification. FYI the Diamond X50NA uses an N connector. The Diamond NR770HBNMO mobile antenna atop their K515S mount uses an SMA connector. You would be well advised to try and keep up with the times before making easily verifiable statements. Anyone that is really in the RF engineering business understands the limitations of the UHF connector. Don't believe me? That's just fine. Nor should you. I didn't either so I made measurements with care. I have data. You do not. Anyone can repeat the measurements. Why don't you? I’m originally from the UK, and I have one request: please stop calling the PL-259 /SO-239 a “UHF” connector. I don’t care about the history of how it got that nickname, the times have moved on. In Europe and Asia, most equipment made for UHF uses N-type connectors already. I don't disagree, but it's their connector for now. Since we are delving into important semantics, your point of referring to this connector family as PL-259/SO-239 is technically incorrect since these two numbers refer to two specific connectors for a specific cable/purpose among dozens in the group. It's a hot mess.